This is one of the best salads I’ve ever eaten. And actually, Mike declared that it was, in fact, the best salad he’d ever eaten! So really, that’s all the endorsement you need, right? 🙂 I’ve had this recipe for BLT Sandwich Salads in my “to make” pile for about a year. I have no idea what took me so long to make it, but it was definitely worth the wait. 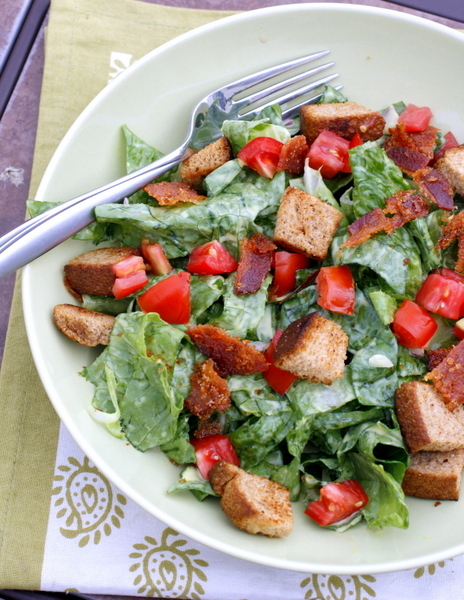 As you can guess from the name, it tastes like a BLT sandwich, but in salad form. Actually it tastes even better than the sandwich because of all the little extras thrown in. 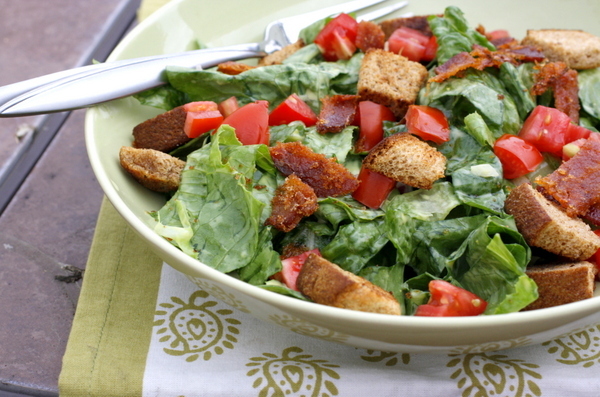 The bacon has a nice layer of brown sugar and spice caramelized on it, the croutons are freshly toasted on the stove, and the dressing is a combination of seemingly simple ingredients turned into something amazingly delicious. Add it all together, and this is one salad we couldn’t stop eating. Preheat the oven to 350 degrees F. Combine the lettuce, onion and tomatoes in a large bowl; set aside. Meanwhile, cut the bread into crouton-size cubes. Melt the butter in a skillet over medium heat. Add the bread cubes and toast, tossing, until golden, about 6 minutes. Set aside to cool. Make the bacon: Mix the brown sugar, paprika, lemon zest and crushed pepper in a small bowl. Add the bacon and press to coat on both sides. Line a baking sheet with parchment paper; place the thyme sprigs on the parchment paper, then lay a strip of bacon on top of each sprig. Bake until the bacon is caramelized and crisp, about 20 minutes. Let cool slightly on the baking sheet. 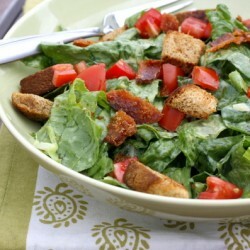 Cut the bacon into bite-size bits using scissors; add to the bowl with the lettuce. Discard the thyme. 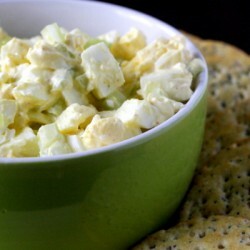 Make the dressing: Whisk the mayonnaise, syrup, mustard and lemon juice in a medium bowl. Add the dressing to the salad and toss. (You may not need to use all of the dressing.) 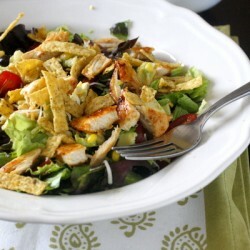 Sprinkle the croutons on top and serve immediately. Oh my goodness, Megan! I can’t decide which part I like the best…the brown sugar on the bacon is perfect, but the maple in the dressing sounds amazing. So perfect for a bacon salad. I can’t wait to try this! This looks gorgeous! I have lots of tomatoes to use up, and a party to go to with a tomato theme – this is perfect! How many servings is it? 2 or 4ish? Great idea! I’d top it with roasted tomatoes, since that’s my new thing. But, this salad looks incredible. The bacon & maple combination likely takes this salad over the top. mmm, i made a similar salad last summer. it was DELISH. but i didn’t season the bacon…will have to try that next time! Oh man–this looks like something I could eat daily! Yum! BLTs were a standard monday night meal at home when i was little. now that i’m a little older, i think making one of my favorite sandwiches into a SALAD makes much more sense! And I’d prefer it anyway. love my veggies 🙂 So creative Megan! Yep. 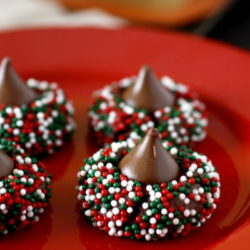 I would gladly eat this every single day. It looks so amazing!